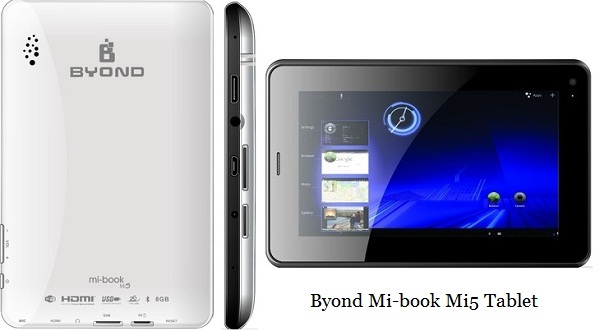 Featuring a 7 inch screen, Mi 5 tablet from Byond is another Mi series tablet that gives you voice calling facility. Lets take a look at what else does this budget tab bring for us. Launched in Nov 2012 last year, Mi 5 is a budget tablet meant to give you the voice calling facility that most seem to be looking for in a tablet nowadays. Apart from this, the tablet can support 3G data speeds with Dongle support. Another, plus point for the tablet is its HDMI port that supports Full HD (1080p) and therefore, allows better video quality. Standard features, including a 4.0.4 ICS Android interface and 800 x 480 resolution give it a competitive feel when it comes to the budget segment. Since, most tabs in the market today priced in this range support the same features. If at all, another plus point for Mi 5 seems to be the 8 GB inbuilt memory space that can be expanded to 32 GB thanks to the microSD card slot space provided. Although, launched for an initial price tag of Rs 7300, its rate had dropped and is now available for Rs 6999 at flipkart. If you have owned this tablet or are using this, do let us know your experiences and views below.